A tribe is a human social system existing before the emergence of nation-states, and, in some cases, continuing to exist independent of the state structure. Historically, tribal societies consisted only of a relatively small, local population. The internal social structure of a tribe can vary greatly from case to case, but is often a relatively simple structure, with few (if any) significant social distinctions between individuals. While anthropologists previously argued for unilineal cultural evolution, with tribes in the position of "stepping stones" to more advanced civilization, Franz Boas and others argued for cultural relativism with the tribes as objects of study in their own right. Later theorists argued for tribal culture as the "natural" state of humankind, and that the simpler, classless community offered greater leisure and less poverty than modern materialistic "advanced" societies. Due to the difficulty in agreeing on the characteristics of tribal society as opposed to structures termed band, clan, or chiefdom, many anthropologists decided to abandon the term as an artificial construct describing only a hypothetical, unreal society. The alternative term, ethnic group, substituted in many cases. Still, the notion of an ideal society, with many of the characteristics often attributed to tribal societies, remains an intriguing and attractive possibility. A tribe, viewed historically or developmentally, consists of a social group existing before the development of, or outside of, states, though some modern theorists hold that "contemporary" tribes can only be understood in terms of their relationship to states. The actual word, "tribe," is of uncertain origin before the Roman usage. The "tri" part of tribe referred to three tribes or political ethnic divisions (Tities, Ramnes, and Luceres), in the ancient Roman state. Gregory Nagy, citing the linguist Émile Benveniste in his Origines de la formation des noms en indo-européen noted that the Umbrian trifu (tribus) is apparently derived from a combination of *tri- and *bhu- where the second element is cognate with the phu- of Greek phule, and that this was subdividing the Greek polis into three phulai. The term is often loosely used to refer to any non-Western or indigenous society. Many anthropologists use the term to refer to societies organized largely on the basis of kinship, especially corporate descent groups (see clan and lineage). Considerable debate has taken place over how best to characterize tribes. Some of this debate stems from perceived differences between pre-state tribes and contemporary tribes; some of this debate reflects more general controversy over cultural evolution and colonialism. In the popular imagination, tribes reflect a way of life that predates, and is more "natural," than that in modern states. Tribes also privilege primordial social ties, are clearly bounded, homogeneous, parochial, and stable. Thus, many believed that tribes organize links between families (including clans and lineages), and provide them with a social and ideological basis for solidarity that is in some way more limited than that of an "ethnic group" or of a "nation." However, anthropological and ethnohistorical research has challenged this view. In his 1972 study, The Notion of the Tribe, Morton Fried provided numerous examples of tribes the members of which spoke different languages and practiced different rituals, or that shared languages and rituals with members of other tribes. Similarly, he provided examples of tribes where people followed different political leaders, or followed the same leaders as members of other tribes. He concluded that tribes in general are characterized by fluid boundaries and heterogeneity, are dynamic, and are not parochial. For various reasons, the term "tribe" fell into disfavor in the latter part of the twentieth century. For many anthropologists, when the term was clearly defined it became an "ideal" concept, with no basis in reality. Thus, it was replaced with the designation "ethnic group," which defines a group of people of common ancestry and language, shared cultural history, and an identifiable territory. This term is also preferred as it overcame the negative connotations that the term "tribe" had acquired under colonialism. Nevertheless, the term "tribe" is still in common use and the term used for recognized Native American governments in the United States. As far back as our knowledge takes us, human beings have lived in families. We know of no period where this was not so. We know of no people who have succeeded for long in dissolving the family or displacing it … Again and again, in spite of proposals for change and actual experiments, human societies have reaffirmed their dependence on the family as the basic unit of human living—the family of father, mother and children. Societies consist minimally of a large extended family, and generally as groups of families connected either by kinship or by geopolitical factors (location, resources, common enemies, and so forth). While a number of societal groups have and continue to exist, those most relevant to understanding the tribe are the band, clan, chiefdom, and ethnic group. A band society is the simplest form of human society. A band generally consists of a small kinship group, no larger than an extended family or small clan. Bands have very informal leadership; the older members of the band generally are looked to for guidance and advice, but there are no written laws and no law enforcement seen typically in more complex societies. Bands' customs are almost always transmitted orally. Formal social institutions are few or non-existent. Religion is generally based on family tradition, individual experience, or counsel from a shaman. Bands are distinguished from tribes in that tribes are generally larger, consisting of many families. Tribes have more social institutions and clearly defined leadership such as a "chief," or "elder." Tribes are also more permanent than bands; a band can cease to exist if only a small group walks out. Many tribes are in fact sub-divided into bands; in the United States, some tribes are made up of official bands that live in specific locations. A clan is a group of people united by kinship and descent, which is defined by perceived descent from a common ancestor. Even if actual lineage patterns are unknown, clan members nonetheless recognize a founding member or "apical ancestor." As kinship based bonds can be merely symbolic in nature some clans share a "stipulated" common ancestor, which is a symbol of the clan's unity. When this ancestor is not human, this is referred to a totem. Generally speaking, kinship differs from biological relation, as it also involves adoption, marriage, and fictive genealogical ties. Clans can be most easily described as sub-groups of tribes and usually constitute groups of 7,000 to 10,000 people. A chiefdom is any community led by an individual known as a chief. In anthropological theory, one model of human social development rooted in ideas of cultural evolution describes a chiefdom as a form of social organization more complex than a tribe, and less complex than a state or a civilization. The most succinct (but still working) definition of a chiefdom in anthropology belongs to Robert Carneiro: "An autonomous political unit comprising a number of villages or communities under the permanent control of a paramount chief"  Chiefdoms have been shown by anthropologists and archaeologists to be a relatively unstable form of social organization. They are prone to cycles of collapse and renewal, in which tribal units band together, expand in power, fragment through some form of social stress, and band together again. An example of this kind of social organization would be the Germanic Peoples who conquered the western Roman Empire in the fifth century C.E. Although commonly referred to as tribes, the Germanic Peoples were by anthropological definition not tribes, but chiefdoms. They had a complex social hierarchy consisting of kings, a warrior aristocracy, common freemen, serfs and slaves. An ethnic group is a human population whose members identify with each other, usually on the basis of a presumed common genealogy or lineage. Ethnic groups are also usually united by common cultural, behavioral, linguistic, or religious practices. In this sense, an ethnic group is also a cultural community. Archaeologists have explored the development of pre-state tribes. Their research suggests that tribal structures constituted one type of adaptation to situations providing plentiful yet unpredictable resources. Such structures proved flexible enough to co-ordinate production and distribution of food in times of scarcity, without limiting or constraining people during times of surplus. Fried, however, proposed that most contemporary tribes do not have their origin in pre-state tribes, but rather in pre-state bands. Such "secondary" tribes, he suggested, actually came about as modern products of state expansion. The existing bands comprise small, mobile, and fluid social formations with weak leadership. They do not generate surpluses, pay no taxes, and support no standing army. Fried argued that through encounters with an expanding state, bands could form tribes in one of two ways. One possibility is that states could set up "secondary" tribes as means to extend administrative and economic influence in their hinterland, where direct political control costs too much. States would encourage (or require) people on their frontiers to form more clearly bounded and centralized polities, because such polities could begin producing surpluses and taxes, and would have a leadership responsive to the needs of neighboring states. The so-called "scheduled" tribes of the United States or of British India provide good examples of this. Alternatively, bands could form "secondary" tribes as a means to defend themselves against state expansion. Members of bands would form more clearly bounded and centralized groups. These would have a leadership that could coordinate economic production and military activities, and thus could support a standing army that could fight against states encroaching on their territory. The head of a tribal form of self-government is generally known as a "tribal chief." The most common types of tribal leadership are the chairman of a council (usually of "elders") and/or a (broader) popular assembly in "parliamentary" cultures, the war chief (can be an alternative or additional post in war time), the hereditary chief, and the politically dominant medicine man (in theocratic cultures). In some cases they merely lead a traditional consultative entity within a larger polity, in other cases tribal autonomy comes closer to statehood. The term tribal chief is usually distinct from chiefs at still lower levels, such as village headman (geographically defined) or clan chief (an essentially genealogical notion). There are many examples of tribes that existed in history around the world. The Twelve Tribes of Israel are a famous early example from biblical history. In India, during the period from 600 B.C.E. to 200 B.C.E., there were many tribes. The Tribal Chief, also known as Raja in those times, led the tribe and was generally the oldest and wisest individual. In Europe, many tribal cultures existed including the Gauls, the Celts, and many others. The Israelites descended from the twelve sons of the Biblical patriarch Jacob who it is said was renamed Israel (meaning "victor") by God (Genesis, 32:28). His twelve male children were Reuben, Simeon, Levi, Judah, Issachar, Zebulun, Dan, Gad, Naphtali, Asher, Joseph, and Benjamin. The families and their descendants of these twelve sons comprise the Twelve Tribes of Israel. These tribes were recorded on the vestments of the Kohen Gadol (high priest). However, when the land of Israel was apportioned among the tribes in the days of Joshua, the tribe of Levi, being guardians and priests, did not receive land. Therefore, when the tribes are listed in reference to their receipt of land, as well as to their encampments during the 40 years of wandering in the desert, the tribe of Joseph is replaced by the tribes of Ephraim and Manasseh (the two sons of Joseph by his Egyptian wife Asenath, whom Jacob elevated to the status of full tribes). 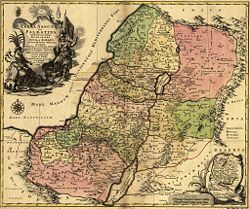 According to the Torah, after the civil war in the time of Solomon's son Rehoboam, ten tribes split off to create the northern kingdom of Israel. Judah, the southern kingdom, had Jerusalem as its capital and was led by King Rehoboam. It was populated by the tribes of Judah, most of Benjamin, some of Levi (who acted as priests and guardians at the Temple of Jerusalem) and also remnants of Simeon who probably were assimilated into the tribe of Judah early on. In 722 B.C.E. the Assyrians under Shalmaneser V and then under Sargon II conquered the northern Kingdom of Israel, destroyed its capital Samaria and sent the Israelites into exile and captivity. Together with the Tribe of Benjamin and elements of the Tribe of Levi, the descendants of Judah, the Tribe of Judah, eventually formed the southern Kingdom of Judah in the ancient Land of Israel. The Judahites were not among the "lost" ten tribes of the northern Kingdom of Israel when it fell to the Assyrians in 722 B.C.E. Instead, the people of Judah were exiled to Babylon about 586, but were eventually able to return and rebuild their nation. In time, the tribe of Judah became identified with the entire Hebrew nation and gave its name to the people known today as the Jews. Europe in ancient times was inhabited by various tribal groups of peoples. Several used violence and earned the epithet "barbarian" in their dealings with others, particularly the more "civilized" Greeks and Romans. Such tribes were either destroyed by the more powerful nation-states, such as Ancient Rome, or were more peacefully subsumed into new or existing kingdoms. An example of such a people, preceding and during the time of the Roman Empire, were the Gauls. The fundamental unit of Gallic politics was the tribe. Each tribe had a council of elders, and initially a king. Later, the executive was an annually-elected magistrate. Among the Aedui, a tribe of Gaul, the executive held the title of "Vergobret," a position much like a king, but its powers were held in check by rules laid down by the council. Although the tribes were moderately stable political entities, Gaul as a whole tended to be politically-divided, there being virtually no unity among the various tribes. Only during particularly trying times, such as the invasion of Caesar, could the Gauls unite under a single leader like Vercingetorix. Even then, however, the faction lines were clear. The tribal groups, or pagi as the Romans called them (singular: pagus; the French word pays, "region," comes from this term) were organized into larger super-tribal groups that the Romans called civitates. These administrative groupings would be taken over by the Romans in their system of local control, and these civitates would also be the basis of France's eventual division into ecclesiastical bishoprics and dioceses, which would remain in place—with slight changes—until the French revolution. 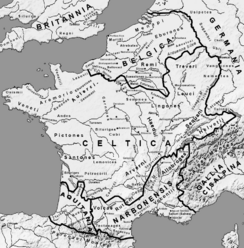 Gauls and Celts in other parts of Europe survived for a considerable time under their own leadership. For example, in Gaelic Ireland, up to the sixteenth century, hundreds of families organized as clans like tribes, were ruled by tribal chiefs or taoisigh, titled according to their family name as The O'Neill, The O'Flaherty, and so forth. A few tribal or clan-based societies, mostly nomadic groups such as the Roma and those in remote areas such as the Nenets people of Northern Russia, and have continued to live autonomously in Europe. Many minority ethnic groups in many countries have founded semi-autonomous regions, such as the Kurds in Iraq. Also, some governments in Africa have little control over far-flung regions with ethnic minorities who function as relatively autonomous tribal societies. In some countries, such as the United States and India, tribes are indigenous peoples that have been granted legal recognition and limited autonomy by the state. Tribal governments can consist of one supreme ruler, a tribal chief, or some form of a tribal council, which usually consists of a group of elders. There are 573 federally recognized tribal governments in the United States.<refFederal and State Recognized tribes '['National Conference of State Legislatures, October, 2016. Retrieved August 20, 2018.</ref> The United States recognizes the right of these tribes to self-government and supports their tribal sovereignty and self-determination. These tribes possess the right to form their own government, to enforce laws (both civil and criminal), to tax, to establish membership, to license and regulate activities, to zone and to exclude persons from tribal territories. Limitations on tribal powers of self-government include the same limitations applicable to states; for example, neither tribes nor states have the power to make war, engage in foreign relations, or coin money. As of 2000, the largest tribes in the U.S. by population were Cherokee, Navajo, Choctaw, Sioux, Chippewa, Apache, Blackfeet, Iroquois, and Pueblo, as well as Latin American tribes. A tribe can be considered to be composed of clans, which are understood to be smaller than a tribe. Thus, the five ancestral clans of the Menominee tribe: the Awaehsaeh (Bear clan), Kene (Eagle clan), Mahwah (Wolf clan), Otea ciah (Crane clan) and Mos (Moose clan), are examples of the seats of traditional power in the tribe. Conversely, a "nation" can be considered to be composed of tribes. In the US the nations were treated as sovereign; thus the Navajo and Cherokee nations. Many Native American tribes in the United States have formed a leadership council, often called the "Tribal Council," and have a leader of the council who generally carries the title of "Chair" (Chairman, Chairperson, Chairwoman). Some simply appoint a "spokesperson" for the Tribal Council. Generally the leadership position is either elected by popular vote of the tribal membership or appointed/elected from among his/her elected tribal council peers in a more parliamentary type of approach. Many of today's tribal chairs are women. Tribal councils in the United States and Canada have a somewhat different status. In the United States, the term usually describes the governing body of a tribe, where the tribe is the basic unit of government. In Canada, the Indian band, usually consisting of one main community, is the fundamental unit of government. Bands may unite to form a tribal council, but they need not do so. Bands that do not belong to a tribal council are said to be "independent." Bands may and do withdraw from tribal councils. Furthermore, the authority that bands delegate to their tribal council varies, with some tribal councils serving as a strong, central organization while others are granted limited power by their members. Historically the US government treated tribes as seats of political power, and made treaties with the tribes as legal entities. Frequently, however, the territory of the tribes fell under the authority of the Bureau of Indian Affairs (BIA) as reservations held in trust for the tribes. Citizenship was formerly considered a tribal matter. For example, it was not until 1924 that the Pueblo people were granted US citizenship, and it was not until 1948 that the Puebloans were granted the right to vote in state elections in New Mexico. In Wisconsin, the Menominee Nation has its own county Menominee County, Wisconsin with special car license plates; 87 percent of the county's population is Native American. Since the Nations were sovereign, with Treaty rights with the Federal government, the Wisconsin tribes innovated Indian gaming, that is, on-reservation gambling casinos. This has been imitated in many of the respective states which still have Native American tribes and has developed into a multi-billion dollar industry nationwide. A large number, (633 in 2003) of Native American tribal entities (First Nations, or formally, Indian Bands) are recognized by Canada under the Constitution Act, treaties, statutes, and court decisions as "self-governing aboriginal nations within Canada." They have formal government-to-government relations with the Crown, enjoy limited internal self-government, and administer their territories, the Indian Reserves. Adivasi ("original inhabitant" in Sanskrit, Adi meaning first and vasi meaning inhabitant) refers to indigenous people in north eastern states of India. These tribes have "chiefs" and they are referred by various names. The Indo-Aryan tribes mentioned in the Rigveda are described as semi-nomadic pastoralists, subdivided into villages (vish) and headed by a tribal chief (raja) and administered by a priestly caste. 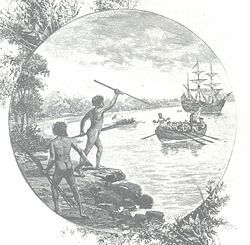 A nineteenth century engraving showing "natives opposing the arrival of Captain James Cook" in 1770. Before British colonization of Australia, there were a great many different Aboriginal groups, each with their own individual culture, belief structure, and language. At the time of European settlement there were well over 200 different languages (in the technical linguistic sense of non-mutually intelligible speech varieties). These cultures overlapped to a greater or lesser extent, and changed over time. Indigenous Australian Aboriginal communities are often called tribes, and there are several hundred in Australia, although the exact number is unknown, because in many parts of Australia, there are no clear tribes, nations, or boundaries. The word "community" is often used to describe Aboriginal groups as a more acceptable word. Sometimes smaller communities are referred to as tribes, and other times many communities are included in the same "tribe." Sometimes the different language groups are called tribes, although it can be very difficult to distinguish between different languages and dialects of a single language. The situation is complicated by the fact that sometimes up to twenty or thirty different names (either spelled differently in English, or using a different word altogether) are used for the same tribe or community. In many parts of Africa, tribal societies continue to function relatively autonomously despite the artificial division of the land into nations by colonial powers. The Bedouin, found in the desert belt extending from the Atlantic coast of the Sahara via the Western Desert, Sinai, and Negev to the eastern coast of the Arabian desert, were traditionally divided into related tribes. 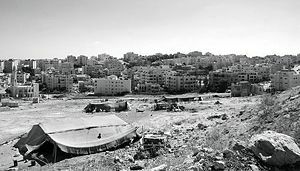 These tribes were organized on several levels- a widely-quoted Bedouin saying is: I against my brothers, I and my brothers against my cousins, I and my brothers and my cousins against the world. The individual family unit (known as a tent or bayt) typically consisted of three or four adults (a married couple plus siblings or parents) and any number of children, and would focus on semi-nomadic pastoralism, migrating throughout the year following water and plant resources. When resources were plentiful, several tents would travel together as a goum. These groups were sometimes linked by patriarchical lineage but just as likely linked by marriage (new wives were especially likely to have male relatives join them), acquaintance or even no clearly defined relation but a simple shared membership in the tribe. The next scale of interactions inside tribal groups was the ibn amm or descent group, commonly of three or five generations. These were often linked to goums, but whereas a goum would generally consist of people all with the same herd type, descent groups were frequently split up over several economic activities (allowing a degree of risk-management: should one group of members of a descent group suffer economically, the other members should be able to support them). Whilst the phrase 'descent group' suggests purely a patriarchical arrangement, in reality these groups were fluid and adapted their genealogies to take in new members. The largest scale of tribal interactions is obviously the tribe as a whole, led by a Sheikh. The tribe often claims descent from one common ancestor, as noted above, this appears patrilineal but in reality new groups could have genealogies invented to tie them in to this ancestor. The tribal level is the level that mediated between the Bedouin and the outside governments and organizations. There are many African Pygmy tribes throughout central Africa, including the Mbuti, Aka, BaBenzelé, Baka, Efé, Twa, and Wochua. Most Pygmies are nomadic, and obtain their food through a mix of foraging, hunting, fishing, and trading with inhabitants of neighboring villages. Their cultural identity is very closely tied to the rainforest, and likewise their spiritual or religious views. Music, as well as dance, is an important aspect of Pygmy life, and features various instruments and intricate vocal polyphony. Pygmies are often romantically portrayed as both utopian and "pre-modern," which overlooks the fact that they have long had relationships with more "modern" non-Pygmy groups (such as inhabitants of nearby villages, agricultural employers, logging companies, evangelical missionaries, and commercial hunters.) 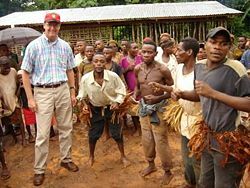 It is often said that Pygmies have no language of their own, speaking only the language of neighboring villagers, but this is not true. Both the Baka and Bayaka (also known as the Aka), for example, have their own unique language distinct from that of neighboring villagers; the Bayaka speak Aka amongst themselves, but many also speak the Bantu language of the villagers. Two of the more studied tribes are the Baka and the Mbuti (who were the subject of the well known book The Forest People (1962) by Colin Turnbull. There is no ruling group or lineage within the Mbuti, and no overlying political organization. The Mbuti are an egalitarian society where men and women basically have equal power. Issues in the community and decisions are made by consensus, and men and women engage in the conversations equally. Little political or social structure exists among the Mbuti. Traditionally, Tuareg of the Sahara and the north-central Sahel region have a hierarchical society, with nobility and vassals. The work of pastoralism was specialized according to social class: imúšaɤ, warrior-aristocrats who organized group defense, livestock raids, and the long-distance caravan trade; ímɤad, vassal-herdsmen who pastured and tended most of the confederation's livestock; ìnhædˤæn, blacksmith-clients who fabricated and repaired the saddles, tools, household equipment and other material needs of the community. After the adoption of Islam, a separate class of religious clerics, the marabout, also became integral to Tuareg social structure. Traditionally, the traders had a higher status than all but the nobility among their more settled compatriots to the south. With time, that difference has eroded, corresponding to the economic fortunes of the two groups. Before French colonization in the early nineteenth century, the Tuareg were organized into loose confederations, each consisting of a dozen or so tribes. Each of the main groups had a traditional leader called Amenokal along with an assembly of tribal chiefs (imɤaran, singular amɤar). 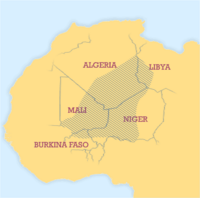 Following the independence of African countries in 1960s, Tuareg territory was artificially divided into modern nations: Niger, Mali, Algeria, Libya, and Burkina Faso. Long-standing competition for resources in the Sahel has impacted Tuareg conflicts with neighboring African groups, especially after political disruption and economic constraints following French colonization, tight restrictions placed on nomadization, and desertification exacerbated by global warming and the increased firewood needs of growing cities. Today, some Tuareg are experimenting with farming; some have been forced to abandon herding, and seek jobs in towns and cities. In the latter part of the twentieth century anthropologists have greatly revised our understanding of the tribe. Franz Boas removed the idea of unilineal cultural evolution from the realm of serious anthropological research as too simplistic, allowing tribes to be studied in their own right, rather than stepping stones to civilization or "living fossils." Anthropologists such as Richard Lee and Marshall Sahlins published studies that showed tribal life as an easy, safe life, the opposite of the traditional theoretical supposition. Sahlins referred to these tribal cultures as "the Original Affluent Society," not for their material wealth, but for their combination of leisure and lack of want. This work formed the foundation for primitivist philosophy, such as that advocated by John Zerzan or Daniel Quinn. These philosophers have led to new tribalists pursuing what Daniel Quinn dubbed the "New Tribal Revolution." The new tribalists use the term "tribalism" not in its traditional, derogatory sense, but to refer to what they see as the defining characteristics of tribal life: namely, an open, egalitarian, classless, and cooperative community, which can be characterized as "primitive communism." New tribalists insist that this is, in fact, the natural state of humanity, and proven by two million years of human evolution. Whether life in this "natural" state was better or worse than life in modern society is a question that remains open to debate, and the answer may depend on each person's preferences as well as on the particular tribes that are used as a point of reference - because tribal life itself was not (and is not) the same for all tribes; the natural environment where a tribe lives has an especially important influence. Life in all human societies, however, has been undeniably difficult, with widespread suffering and injustice. The solution to social problems may not be found only in the external structure of society, but rather in the hearts and minds of human beings. ↑ Tribe Merriam-Webster Dictionary. Retrieved August 20, 2018. ↑ Margaret Mead and Ken Heyman, Family (New York, NY: Macmillan, 1965), 77-78. ↑ Fact Sheet includes U.S. relationship to tribes U.S. Department of State, 2005. Retrieved August 20, 2018. ↑ Largest American Indian and Alaska Native tribes according to number of self-identified members, by race and tribal group: 2000 National Center for Education Statistics. Retrieved August 20, 2018. ↑ Daniel Joseph Duke, Aka as a Contact Language: Sociolinguistic and Grammatical Evidence (University of Texas at Arlington, 2001). Benveniste, Émile. Origines de la formation des noms en indo-européen. 1935. Carneiro, R.L. "The Chiefdom: Precursor of the State" in The Transition to Statehood in the New World. Cambridge, UK – New York, NY: Cambridge University Press, 1981, 37–79. Carneiro, R.L. "The Nature of the Chiefdom as Revealed by Evidence from the Cauca Valley of Colombia" in Profiles in Cultural Evolution. Ann Arbor, MI: University of Michigan Press, 1991, 167–90. Duke, Daniel Joseph. Aka as a Contact Language: Sociolinguistic and Grammatical Evidence. University of Texas at Arlington, 2001. This page was last modified on 20 August 2018, at 17:21.